Script Dated: December 22, 1942. This is an Original Movie Script from the 1943 Universal Studios Horror Classic, Son of Dracula.
" The Cover has the original Working Title of the film, which was "Destiny. This screenplay was written by, Eric Taylor. This is the actual FILE COPY used by Universal Studios for their own records of the film. It was kept in their Central Files at the movie studio for many many years. It has the original Universal Studios "Central Files" stamp on the cover. It is also stamped at the top right of the cover page with the Production Number of this film. This script has several original Yellow colored revision pages inside. There are also handwritten notes on many of the pages. I only took pictures of around 10 different pages so you can get a good idea of what is there, but there are a lot more handwritten notes throughout the script other than just what you see in the pictures. This script is Complete and is 125 pages long. The cover page has a small piece of tape on the bottom left corner where the brass brad is. Please view the pictures above carefully. The script is in very good overall condition with signs of age. Count Alucard finds his way from Budapest to the swamps of the Deep South after meeting Katherine Caldwell, of the moneyed Caldwell clan that runs a plantation called Dark Oaks. She's obsessed with occult matters. Who better to guide her through this supernatural world than Count Alucard, whose name no one bothers to spell backwards? No one, that is, except the wily Dr. Brewster, an old family friend. He'll join Professor Lazlo, a specialist in the occult, in fighting this "Alucard" and the woman he's influenced. Or has Katherine influenced him? Meanwhile, Katherine's fiancé, Frank Stanley, will find his courage and his sanity sorely tested when he accidentally shoots Katherine to death, yet finds that she goes on living. THE POSTER SHOWN IN THE LAST PICTURE ABOVE IS NOT INCLUDED, IT IS JUST BEING USED AS A VISUAL REFERENCE. Specializes in rare and collectible movie scripts. Our scripts are genuine, authentic and screen used. We also carry movie props from no genre in particular. Furthermore, all of our items that are not props or scripts can be found in our Other Memorabilia category. We do not sell reproductions or fakes. 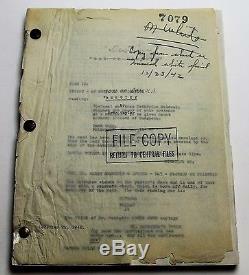 The item "SON OF DRACULA 1942 Original Movie Script Universal Studios Horror Film" is in sale since Sunday, March 19, 2017. This item is in the category "Entertainment Memorabilia\Movie Memorabilia\Scripts\Originals\Unsigned". The seller is "themoviewizard" and is located in Van Nuys, California.